Winters here in Missouri can be a real witch. 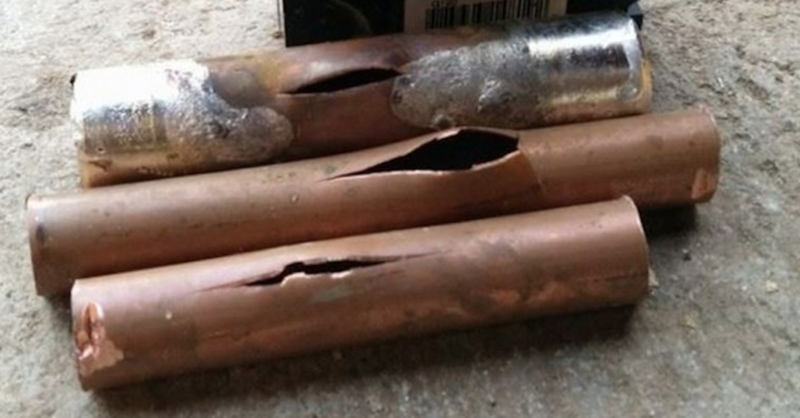 It can play hell on older water pipes, especially copper pipes. They do burst from time to time once they freeze. And that really bites. Keep the faucet open. As the frozen area starts melting, water will flow and running water will help melt the ice in the pipe over time. Apply heat to the frozen area using an electric heating pad wrapped around the pipe, or an electric hair dryer. Even towels soaked in hot water. Use a portable space heater to heat the room, but make sure that it’s kept away from any flammable materials. (Never leave heater unattended by the way). Apply heat until full water pressure is restored. This can take as much as 6 hours and on rare occasions more. If you don’t have the items above, please, don’t improvise! No blow torches. No open fires (yes we’ve seen that before). Just give us a call and we’ll come to the rescue. Also, don’t attempt any repairs while the pipes are frozen. You will get bursts, sometimes so small that you don’t see them. That will lead to leaks and even more damage down the road. So, you know, don’t do that! We are open 24/7 even on Holidays. We are Columbia’s preferred master plumber, and we’ll come when your pipes freeze even when the other guys won’t. Stay warm Columbia!